Governments in the nation’s most water-rich region are responding to public pressure over high-profile water pollution concerns, but have left fundamental policy changes largely untouched. A petition filed by 16 Wisconsin citizens to the U.S. EPA last month claims budget cuts and changes to state law have made the Wisconsin DNR an ineffective guardian of the state’s water. 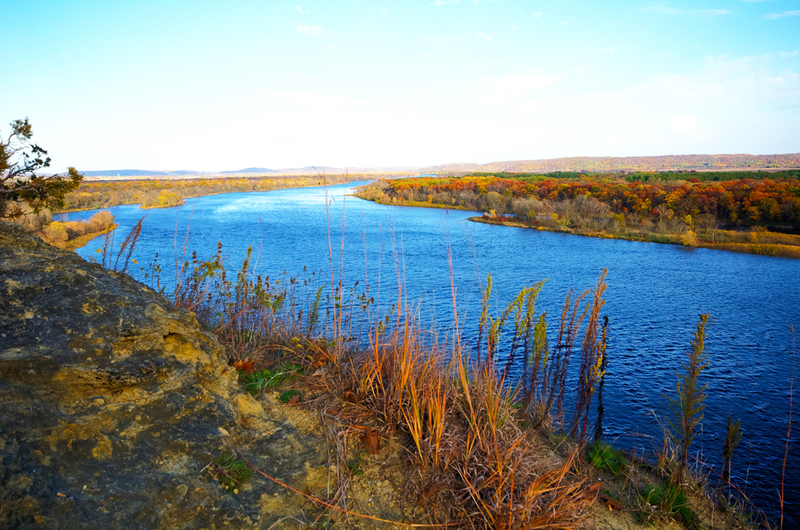 Here, the Wisconsin River flows through the Lower Wisconsin State Riverway, a 32,000-hectare (80,000-acre) state recreation area.Click image to enlarge. After years of watching their state do little to address stormwater runoff, polluted wells, and noxious algae blooms in once clear waters, 16 Wisconsin citizens last month decided enough was enough. They filed a petition with the federal Environmental Protection Agency to force Wisconsin to correct failures in its clean water program or else take away Wisconsin’s authority to administer permits under the Clean Water Act. It is a step of last resort expressing an utter lack of confidence in the state government’s ability and desire to protect its waterways. The past two decades have seen the dismantling of the Wisconsin Department of Natural Resources, the state agency in charge of issuing and enforcing clean water regulations, according to Kim Wright, executive director of Midwest Environmental Advocates. The agency’s workforce has declined 18 percent since 1995. Last summer Republican Governor Scott Walker abolished the agency’s water division and its Bureau of Science Services while eliminating 18 staff positions. Midwest Environmental Advocates, a Madison-based nonprofit law center, filed the petition for corrective action on behalf of the 16 individual citizens. The budget and staff cuts, and other changes, seriously harmed the agency’s ability to protect water, according to the petition, which also references a 2011 letter from the EPA that outlined problems within the state’s Clean Water Act programs. Wisconsin is not the only state in the Great Lakes region struggling to come to terms with an array of emerging and persistent water problems. Toxic algal blooms in western Lake Erie shut down water supplies for half a million people in Toledo, Ohio, last year, and reached their highest intensity on record this year. Blooms of the same algae fouled more than 600 miles of the Ohio River in September. In response to lead-contaminated drinking water in Flint, Michigan, the EPA announced last week that it will audit the state’s drinking water program to “ensure that MDEQ maintains reliable drinking water supplies that meet all of the requirements of the Safe Drinking Water Act”. Invasive Asian Carp in Illinois and nitrate pollution in Minnesota also pose risks to human, environmental, and economic health. The Great Lakes states have an admirable track record when it comes to banding together to protect their water resources. They reined in phosphorus pollution from factories and wastewater treatment plants with the 1987 Great Lakes Quality Agreement and ensured water would not be diverted outside the basin with the 2008 Great Lakes Compact. The states have also been ardent supporters of the federal Great Lakes Restoration Initiative, which has so far poured more than $US 1.6 billion into the region and cleaned up six contaminated sites listed as areas of concern. 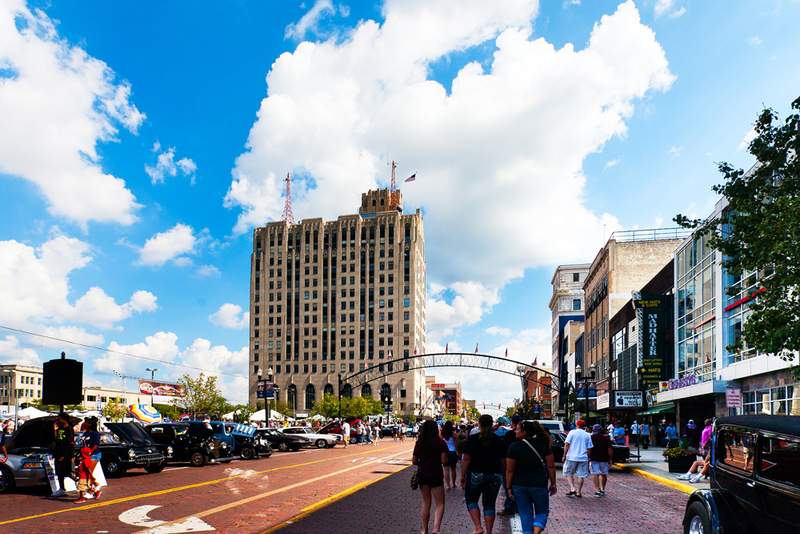 But the Wisconsin petition, the EPA’s action in Michigan, and the burgeoning algal blooms in Lake Erie raise questions about whether the Great Lakes states have the will and ability to tackle the complex and politically sensitive drivers of the region’s current water problems. It is a question with potential implications for national water protections; the region is home to one presidential candidate — Ohio Republican Governor John Kasich – and a second candidate who dropped out of the race in September — Wisconsin Republican Governor Scott Walker. Wisconsin Republican Representative Paul Ryan became Speaker of the House in October. 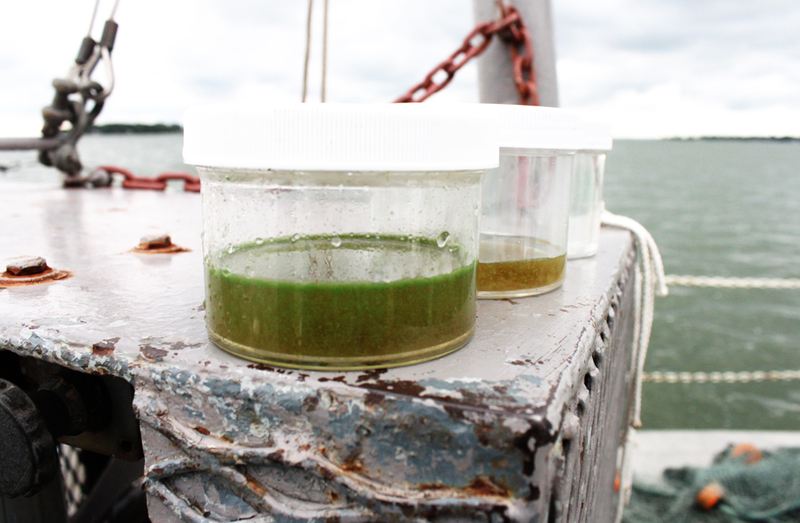 A sample of water from Lake Erie near South Bass Island shows a gradient of toxin-producing cyanobacteria, commonly called algae. Algae blooms in the lake’s western basin have poisoned municipal drinking water supplies and forced state lawmakers to act to curb the nutrient pollution that drives them. Click image to enlarge. “What we are facing now is a series of challenges that has to deal not just with funding, but with resolve and creating an idea about the future of what the Great Lakes can be, and what we as the people who live here want it to be,” Joel Brammeier, president and CEO of the Chicago-based Alliance for the Great Lakes, told Circle of Blue. “These challenges that are cropping up like algae blooms, or the fact that we are at the center of a North American oil transportation network, or what does it mean for us to be sitting on top of 20 percent of the world’s fresh water when environments and economies across North America are being challenged by drought — those questions are not going to be dealt with by spending money. When Toledo lost its drinking water for nearly three days last year, toxic algae blooms caused by excess amounts of phosphorus in Lake Erie became a problem that could no longer be ignored. Ohio immediately began taking steps to mobilize funding to allow cities to test for algal toxins and improve their wastewater treatment systems, and federal lawmakers from the state worked to fund projects aimed at reducing phosphorus runoff from farmland. Seven months after the crisis, more than $US 188 million in state and federal funds had been directed to address the problem. Most significantly, the state passed a law in April regulating farmers in the western Lake Erie basin. Governor Kasich also joined Michigan Governor Rick Snyder and Ontario Premier Kathleen Wynne this June in signing a binational commitment to cut the amount of phosphorus pollution flowing into western Lake Erie by 40 percent over the next 10 years. And the state is currently involved in a lawsuit to force the U.S. Army Corps of Engineers to pay for placing sediment dredged from the Cuyahoga River—which the state contends is polluted—in a disposal facility instead of in Lake Erie to safeguard water quality. Nonetheless, a fundamental shift in the state’s water protections has not materialized. The U.S. EPA is auditing Michigan’s state drinking water program after high levels of lead were found in public drinking water supplies in Flint.Click image to enlarge. The regulations on fertilizer and manure applications, for example, only apply in the western Lake Erie basin, despite four other state drinking water sources outside of the basin being listed as impaired by algal toxins. Large livestock farms that are too small to need permits, but large enough to have a cumulative effect on the water quality of nearby streams and lakes, are also an outstanding source of pollution that the state has yet to address, Rissien said. Those changes could take time. States have little example to follow when it comes to regulating agriculture and other sources of nonpoint pollution, a term that refers to any fertilizer, sediment, chemical, or other polluting substance that washes off of land as opposed to out of a factory, power plant, or water treatment facility. Nonpoint source pollution was deliberately exempt from much of the federal Clean Water Act, and the federal government has done little but encourage states to implement best management practices to reduce it. For example, a coalition of Great Lakes environmental groups called on the federal EPA in October to list the western basin of Lake Erie as impaired, a distinction that would trigger requirements under the Clean Water Act for a “pollution diet” for the watersheds flowing into the lake. Involving the federal government could also help enforce the commitment signed by Michigan, Ohio, and Ontario to reduce phosphorus pollution in the lake, according to Hall. Leadership on water issues has often shifted between the state and federal level, Hall said. A prime example is the Wisconsin DNR, long considered a national leader in water management and protection in large part due to the independence of its secretary, who for 70 years was appointed by a citizen board, according to Midwest Environmental Advocates’ Wright. The state changed the position back to a gubernatorial appointment in 1995. 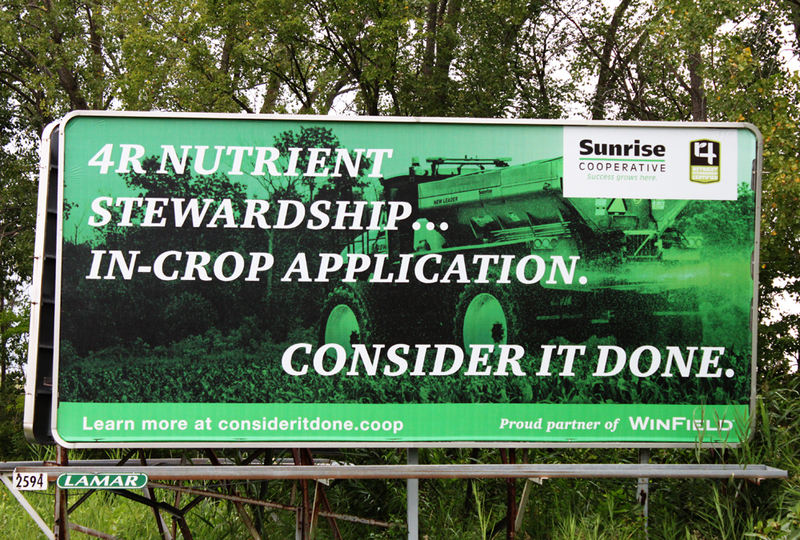 A roadside billboard in northern Ohio urges farmers to apply the right type of fertilizer, at the right rate, in the right place, and at the right time. These voluntary practices are aimed at reducing nutrient runoff into the Lake Erie watershed, where it feeds harmful algae blooms. Click image to enlarge. “I’ve worked in or with the DNR for 30 years,” Wright told Circle of Blue. “It’s been this leader, and we have a great university system, but the DNR had a really important functional role. Ten years of frustrating legal challenges over water pollution permits issued by the hobbled agency prompted the 16 citizens named in the petition to take action, Wright said. The Wisconsin DNR did not respond to requests for comment. In a press release dated October 28, the agency said proposed rule revisions to the state Pollutant Discharge Elimination System permit program would address 21 of the 75 concerns raised by the U.S. EPA in 2011. It said the agency has resolved another 36 of the concerns “through rulemaking or other means” and is addressing the remaining 18 concerns through two other rule packages. While the federal government may be able to nudge states toward stricter water protections through regulation, the public is also an important player in encouraging action at the state level, according to Wright. Communities concerned about water need to speak up, she said.